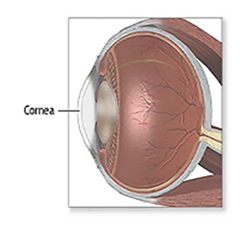 The cornea is the clear, transparent front layer of the eye which admits light and begins the refractive process, playing an essential role in the clarity of a person’s vision. The cornea is also an integral part of the eye’s structure, maintaining the eye’s spherical shape and keeping foreign particles from entering the eye. Light rays enter the eye through the cornea, the clear front “window” of the eye. The cornea’s refractive power bends the light in such a way that it passes freely through the pupil to the eye’s crystalline lens. The lens changes its shape as needed to focus the light sharply upon the retina, a light-sensitive layer of tissue inside the eye. The retina transmits these light impulses to the optic nerve and on to the visual centers of the brain. If the cornea becomes opaque or misshapen due to disease or trauma, light cannot enter the eye properly, and the resulting vision is blurry or distorted. In some patients with corneal disease or injury, a corneal transplant is the only hope for restoring their vision. All transplanted corneal tissue comes from carefully screened deceased donors. A corneal transplant is a surgical procedure in which a patient’s diseased or damaged cornea is replaced with a healthy, clear cornea donated by a carefully screened deceased donor. A corneal transplant cannot treat all forms of blindness. However, for individuals with corneal blindness that cannot be corrected with less invasive measures, a corneal transplant remains the gold standard of treatment. Can other parts of the eye be transplanted? Yes. In addition to corneal tissue, the Florida Lions Eye Bank also provides scleral tissue for surgery. The sclera is the tough, white, opaque portion of the eye. To prepare this tissue for surgery, eye bank technicians recover whole eyes from donors and process the tissue in the laboratory. The resulting scleral grafts are used during glaucoma surgeries or oculoplastic procedures. Each whole eye can yield 8 individual pieces of scleral tissue, in addition to one cornea. Thus, a single eye donor can impact the lives of 18 transplant recipients, and countless others through research and education.